A sketch of Jonathan Rose Companies' proposed senior-residential complex at the town-owned Baron's South property. 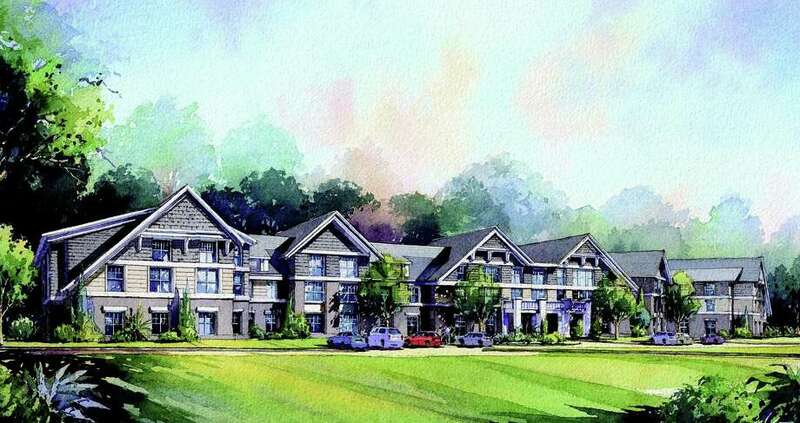 The Baron's South Committee has unanimously selected Jonathan Rose Companies, which has offices in Stamford and New Haven, as the developer of a proposed senior housing complex on town-owned property between Compo Road South, Imperial Avenue and Post Road East. The development could include up to 150 units and is aimed at giving longtime Westport residents an affordable retirement housing option. The proposal calls for 30 percent of the rental units to be set aside as affordable, with 30 percent mid-range and 40 percent market rate. Jonathan Rose was one of three companies that submitted a bid in response to a request for proposal (RFP) to the town, the second round of bids on the project conducted by the committee. Atria Senior Living of Louisville, Ky., was eliminated as a possible developer because the committee felt its proposed rents were too high, and Cleveland's TransCon Builders was knocked out contention because it wanted to build at least 150 units. "No doubt Rose was the right company," said Baron's South Committee Co-chairwoman Marty Hauhuth. Jonathan Rose submitted a bid last year to develop a senior resdiential complex on Baron's South that was endorsed by the committee, but abandoned after criticism from the Board of Finance, which felt the proposal did not bring enough value back to the town. Features in the new Rose proposal include: 28 "memory-care units" designed for residents who may have Alzheimer's disease, dementia or other forms of cognitive impairment; all affordable units would be one-bedroom apartments rented at $1,084 per month; market rate, one-bedroom apartments would be rented with fewer amenities at $2,200 per month and $4,750 per month with full-scale amenities; two-bedroom apartments would rent for $2,800 monthly with fewer amenities and $6,350 with a wider range; an opt-in $1,500 monthly expenditure for one meal a day and housekeeping. Rose's proposal will now be examined in more detail, with the committee and the developer working more closely on details before it is passed on to other town boards for review. "Now that we have made our decision, we are hoping for a direct conversation, because we were very careful not to do that while we were making the decision," Hauhuth said. Caroline Vary, who made the final presentation for Jonathan Rose, was unavailable for comment. Among the details that need to be addressed is how much money will be returned to the town -- either as an upfront payment or through an ongoing program -- to compensate for relinquishing control of the 22.7-acre property, which the town acquired in January 1999. In the RFP submitted to the town, Jonathan Rose states, "Our proposal provides significant revenue to the town of Westport, including an upfront payment of $5,000,000 and on ongoing annual PILOT of $625,000, which increases annually at the same rate as the mill rate, resulting in a 75-year Net Present Value of $19,668,876. We also present an optional Phase II, which could garner additional revenue to the town." In 2004 the town built the Westport Center for Senior Activities on a portion of the Baron's South property, and Hauhuth said the committee and the developer need to decide how much synergy will exist between the center and the housing development. "There's a lot of stuff to be pinned down," Hauhuth said. The project will next go to the Board of Selectmen. If they endorse it, the plans will then go to the Board of Finance. Hauhuth said there is no timetable to begin construction. "Obviously we feel this is very important and we'd like to get the shovel in the ground as soon as possible," she said.